I am just going to come right out and say it. I love Thanksgiving. The contrast between the sugar-filled, goblin-infested, never-ending observance of Halloween could not be in greater contrast to the bounty-celebrating, family-centered, gratitude-focused holiday that is Thanksgiving. Thanksgiving offers a beautiful opportunity to come together and reflect on what matters most to you and your family and to be thankful for exactly that. What could be better? It also has the potential for setting the tone for the rest of the holiday season through the New Year. For all the flack other holidays get for being materialistic (which doesn’t have to be—more on that in a future article), Thanksgiving doesn’t get nearly enough credit for how lovely it is. Parents can make the most of this holiday by instilling in their children an appreciation of its history and inherent call to give thanks. As the familiar tale goes, in 1621, over a period of three days, Pilgrims and Native Americans came together in celebration of the new settlers’ first successful harvest. Kids may find it interesting that the menu back then was a bit different from what they’ll likely find on their table in 2015. Instead of turkey, pumpkin pie, and mashed potatoes, they ate venison and barley in addition to corn and other fowl, according to Yankee Magazine. The celebration didn’t catch on as an annual tradition for quite some time. President George Washington proclaimed the holiday of Thanksgiving on Thursday, Nov. 26, 1789, but it wasn’t truly celebrated nationwide until writer Sara Josepha Hale (who wrote “Mary Had a Little Lamb”) campaigned for many years and, finally, convinced President Abraham Lincoln, who established Thanksgiving as a national holiday in 1863. History has a number of short videos explaining how Thanksgiving came to be. There are many great books out there depicting this colorful time in America’s history—from the perspective of the Pilgrims fleeing religious persecution and settling in a strange land to the Native inhabitants of the land and their experiences with these new arrivals. Check out Joseph Bruchac’s “Sacajawea” and “Squanto’s Journey.” To dive deeper, don’t miss “The Mayflower and the Pilgrims’ New World” by Nathaniel Philbrick. Want to learn even more? Click to the Plimoth Plantation of Plymouth, Mass., where they offer a number of online learning resources for kids. Better yet, take a real-life trip to their living museum and immerse your family in the 1600s. Family traditions provide a sense of security, comfort, and joy to children and can reinforce important lessons about your own family’s values. My mom always makes her amazing pumpkin pie. My kids are in charge of making the biscuits. My son crafts table place cards with birds on them. I make a rather fancy macaroni and cheese and my grandmother’s Scottish shortbread. And, of course, we make sure we see the “real” Santa make his way to Herald Square at the end of the Thanksgiving Day Parade. 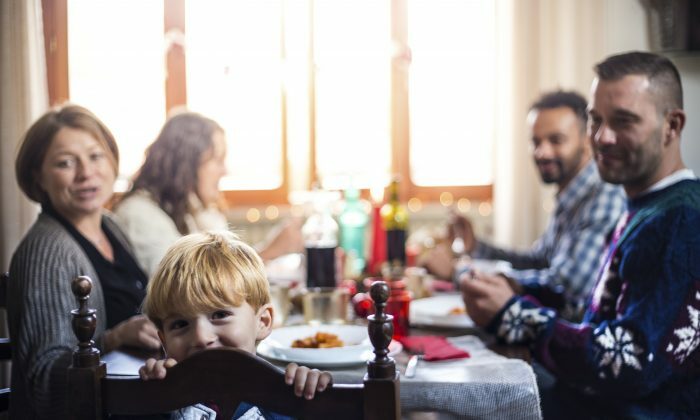 These are a few of the many traditions that make Thanksgiving feel like Thanksgiving in our family and remind us of the joy that lies in our time together. What are yours? Is it time for a new tradition, or have some fallen by the wayside, leaving you wanting to reinstate them? Whatever the case, involve your children in your holiday traditions and see, as the years go by, how these become some of their most treasured childhood memories. For every holiday and season, I ensure that my kids have topical books within arm’s reach to both keep their selections fresh and enhance their appreciation for the time of year. There are a number of wonderful books that center on Thanksgiving. Some of my favorites are “Strega Nona’s Harvest” by Tomie dePaola; “Bear Says Thanks” by Karma Wilson and Jane Chapman; “Over the River and Through the Wood,” the classic poem of L. Maria Child illustrated by Matt Tavares; and two new board books for little ones: “Thanksgiving Parade” and “Turkey Time!” by Melanie Matthews. Thanksgiving, like no other holiday, puts being thankful at the heart of it all. If you want to give your children a gift they’ll enjoy for their entire lives, hop on the Thanksgiving train and teach them how to maintain a heart of gratitude. An “attitude of gratitude,” as they say, has garnered quite a lot of attention in recent years, and scientific studies have shown numerous benefits correlated to regularly giving thanks. You don’t need scientific proof, though, to easily see the improvement in your life after shifting your mindset to one of gratitude. Thanksgiving is the perfect time to kick that into high gear. One of my favorite parts of Thanksgiving is the classic and simple paper chain my family and I create out of strips of construction paper. During the month of November, before bed each night, we write one thing we are thankful for and add our link to the chain. At the end of the month, we have a festive paper chain decorating our home and reminding us of how truly blessed we are. You don’t have to get crafty, though. When you tuck your kids in at night, ask them to name one thing they are grateful for before going to sleep. Make it a habit to notice the wonderful parts of your life and share that with your family. Be thankful for your home, your food, your clothes, the air you breathe, the sun that greets you each morning, and each other. Be thankful for Thanksgiving and allow that attitude of gratitude to carry you and your family through the entire holiday season this year. The autumn provides many opportunities for parents and kids to enjoy family traditions and togetherness. Here are 16 ways to enjoy fall with your family. Parents understand how powerful natural curiosity is and how capable their children are of exploring and learning independently. Columbus Day presents a unique opportunity for parents to explore history with their kids.